I am quickly realizing, as we reach week #7 in this 52-week challenge, that I don’t know nearly as much about my ancestors as I thought – especially the women. I believe it was during one of Dear Myrtle’s recent Mondays With Myrt Google Hangouts that someone cautioned us to not neglect the women in our family trees. It’s one thing to record the name of a direct ancestor’s wife, but we should do more than that. So here I am, looking at my great-grandmother Mary “May” L. Gulick, and scratching my head. May was my great-grandfather Frank G. Roberts’ wife. 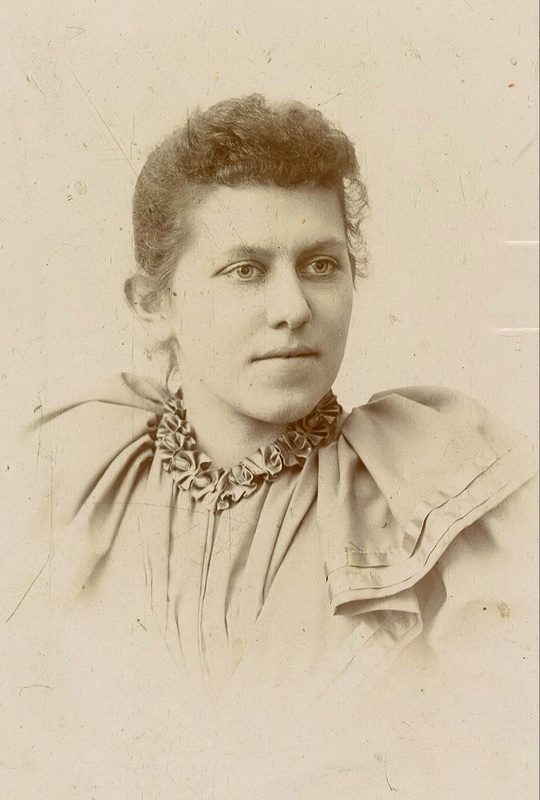 She was born in August 1870 in Danville, Montour County, Pennsylvania to John B. Gulick and Clara Hiler (or Heiler, depending on how it was spelled at any given time). Yes, I know when she married my great-grandfather. And I know that they had three children together. Her name appears frequently in the social pages of the newspapers of Elmira, New York, where she lived the rest of her life after marriage. She died in 1943 at the age of 73 in Elmira, and is buried in Elmira’s Woodlawn Cemetery. I can find no obituary. All I really know of her is what she looked like, in the lovely photograph above, where her clear (blue?) eyes gaze outwards. I wish I knew more. Have you thought of checking newspapers.com or newspaperarchive.com to see if she’s written up in the Elmira paper at all? Or The Ancestor Hunt blog gives websites to find local newspapers in every state. Small local papers write stories on the darnedest things I’ve found: people visiting others, going in and out of the hospital, PTA meetings, who decorated the church for a party, family only 50th wedding anniversary celebrations, and, obituaries to name a few. Good luck in finding something more! Jo – I had checked all the usual sources, including the great Fulton History newspaper site. That’s usually where I find all my New York obituaries. I figured there must be some strange way her name was listed because I couldn’t find anything. That, or there just wasn’t an obit. But your comment made me think harder, and then I remembered that the Chemung County Library in Elmira has an obituary index. I checked, and there IS an obituary! All I need to do is write and they will send me a copy. Thanks for the memory jog!